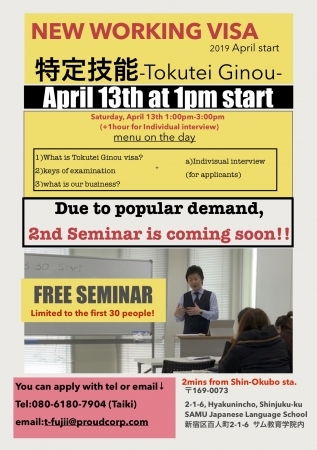 特定技能-Tokutei Ginou- visa is new institution for accepting foreign workers. And Now We tell what should you do for taking the new visa. ・All visitors will get Educational tools. ・People shared this post get priorities for this seminar. ・People bring friends get drink tickets for a Izakaya in Sagamihara, Kanagawa. If you feel "intersted", please send me a message or call.